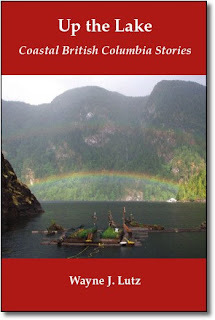 As a special thank you to all of our blog readers, here are three Kindle ebooks just for you. 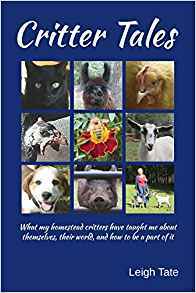 Last week I was a guest author about Mason Bees on Farmgal's Just Another Day on the Farm. 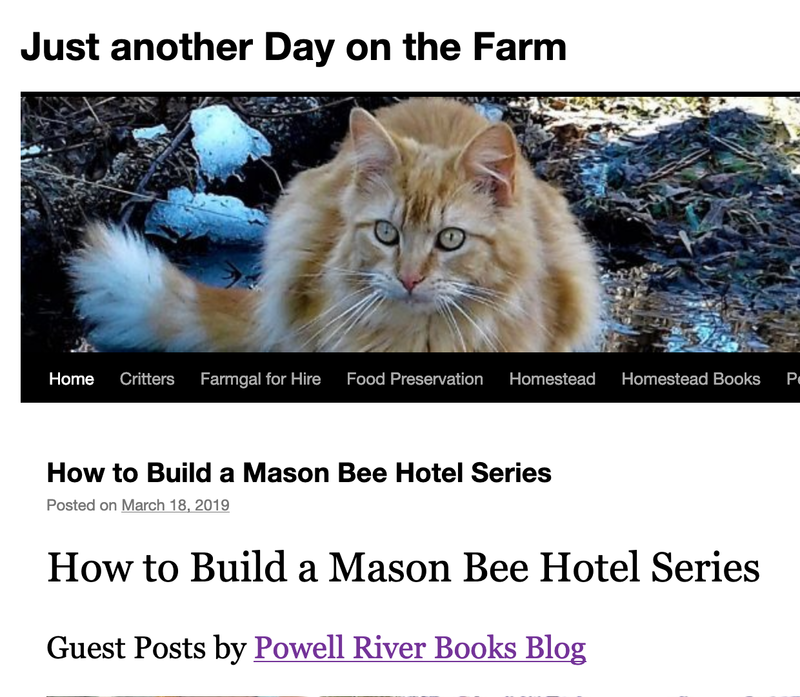 You can read about it and find links to my previous Mason Bee posts by clicking here. We just came home after two months away. 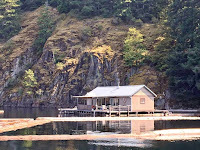 In my recent post Back Up the Lake I speculated about what we might find. One thing I was anxious to check was my Mason Bee nesting blocks. Mason Bees start emerging from their cocoons in March. It's a fun process to watch and I hoped I hadn't missed it. Even before I went inside the cabin, I looked at my Mason Bee winter storage box on the side porch. It's a cool spot that only gets a wee bit of sunshine. All was quiet. 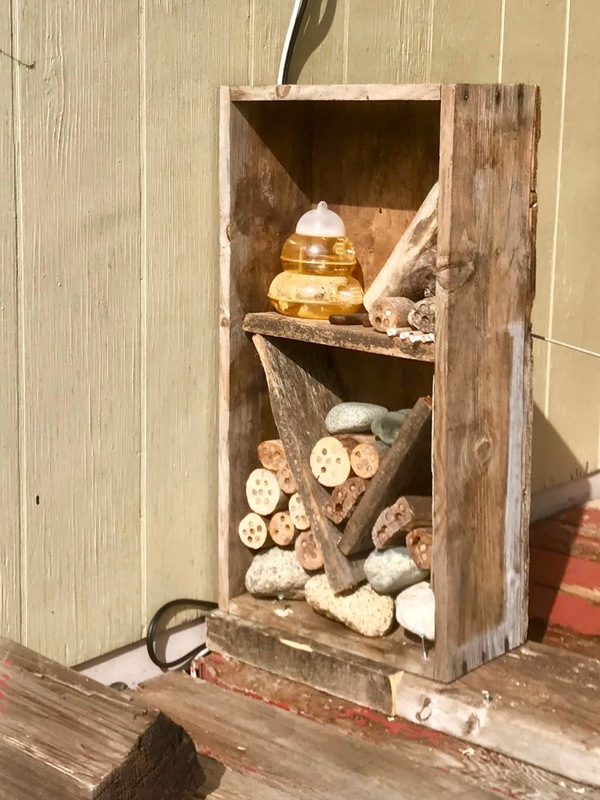 I took the opportunity to refurbish my two bee hotels. 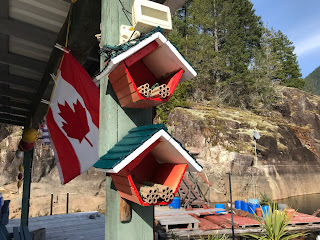 The refurbished Bee Hotels with their nesting tubes. Nesting blocks filled with cocoons. They haven't had any maintenance since they were repurposed from old birdhouses and attached to a south-facing post on our front porch. The fresh paint not only made them look better, but helped preserve their fiberboard construction for a few more years to come. Wayne helped me moved the heavy winter storage box to a spot under the porch near the Bee Hotels. 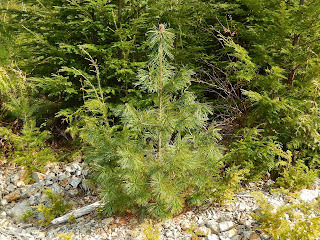 It will be protected from any spring showers, yet it will be close enough to the hotels for nesting. 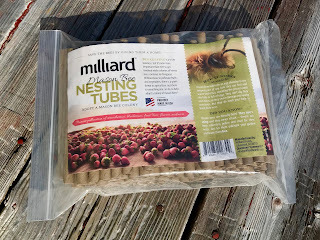 Commercial Mason Bee nesting tubes. My drilled wood nesting blocks are all full of cocoons. I needed something quick and easy to use for the emerging bees. I chose Milliard cardboard Mason Bee nesting tubes. 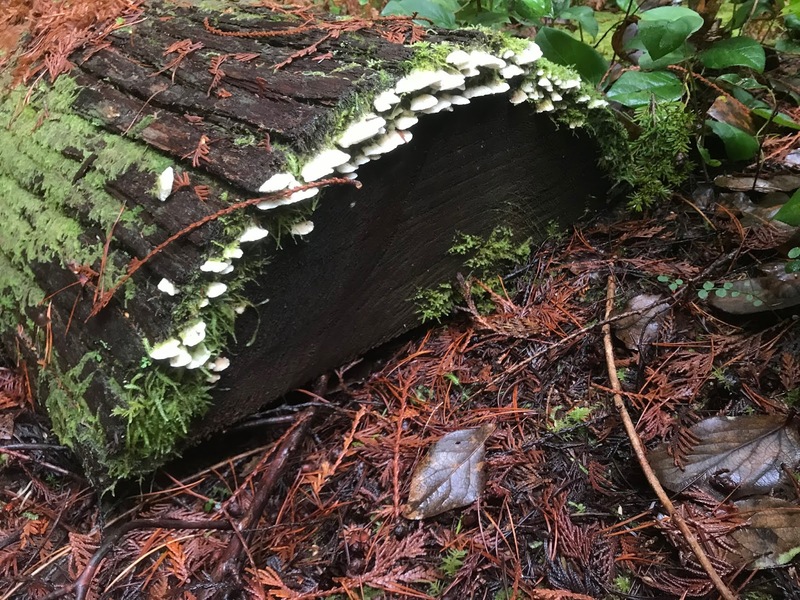 I prefer the homemade wood ones because they are safe to be left outdoors in a protected spot. Mice love to chew cardboard tubes, so they have to be stored either indoors (in a cool spot) or in a protective container outdoors. Now the full nesting blocks and the refurbished Mason Bee hotels are on the south facing side of our front porch. The recent warm weather and sun are sure to give them the clue that it's time to emerge. 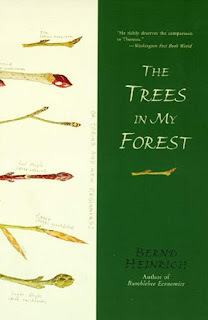 Do you have nesting places for native bees. It's fun and easy. 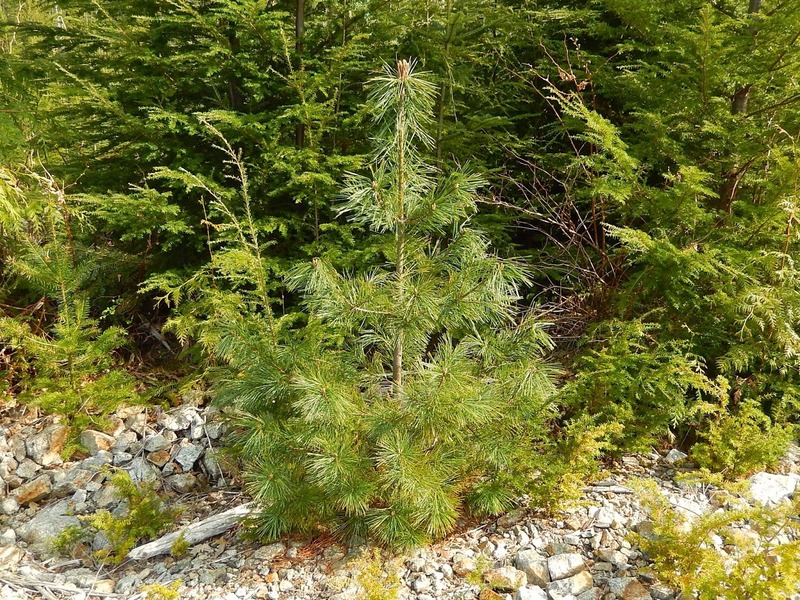 Here's an online resource to use to get started. Also, plant pollinator friendly flowers in your garden. Bees need all the help we can give them. 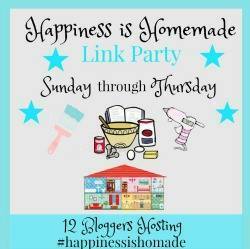 Head over to Blogghetti for Happiness is Homemade to see more recipes, crafts and DIY projects. 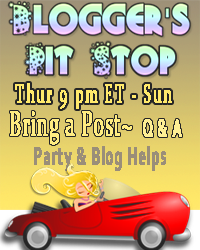 A Thursday site to visit, Frugal Living on the Ranch's Bloggers Pit Stop. 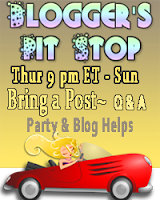 Te first of a three part guest post series. Earlier this month, I made a comment on Farmgal's blog Just Another Day on the Farm. It was a post about ordering Mason and Leaf Cutter bee cocoons and an interesting viewing house to watch all the action inside. 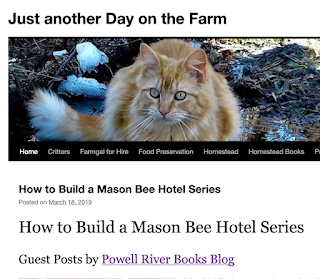 That led to an invitation to write guest posts about my Mason Bee hotel experiences. 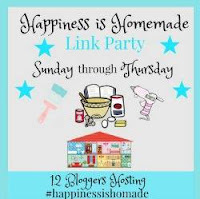 Click the links below to read the posts. 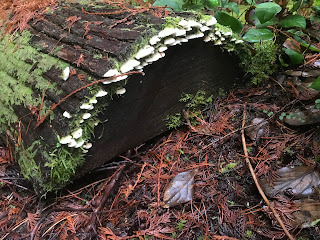 Monday was the first of three guest posts in Farmgal's How to Build a Mason Bee Hotel Series. It tells how Wayne and I made nesting blocks by drilling pieces of driftwood. Wayne helped me drill the holes part way through the blocks. 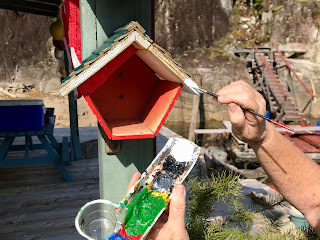 Tuesday's guest post focused on how we repurposed old birdhouses into Mason Bee hotels to hang on our front porch's south facing post. Giving the old birdhouse a facelift with new paint. 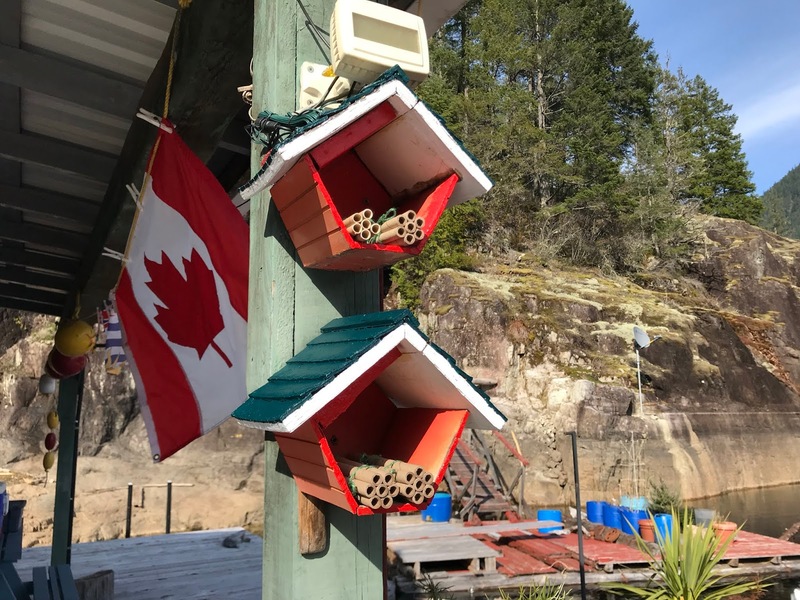 Wednesday's guest post focused on attracting mason bees and caring for their nesting blocks through the year. We mount the Bee Hotels on a south facing surface. 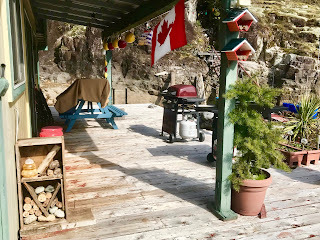 If you would like to read my original Powell River Books Blog posts in their entirety, please click on the links below. It all started in 2015 with two native Mason Bees nesting behind a small solar panel on our front porch. The two original Mason Bees nesting in a crevice on the front porch in 2015. Each year we've expanded the number of nesting blocks to accommodate all of the bees we are helping to multiply. That's good for my garden and for the natural surroundings where we live. 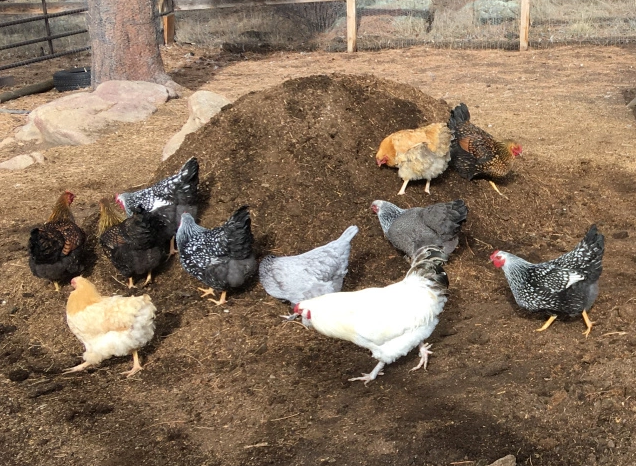 Chickens pictured on Farmgal's blog. Thank you Farmgal for letting us share our experiences. Yea!!! 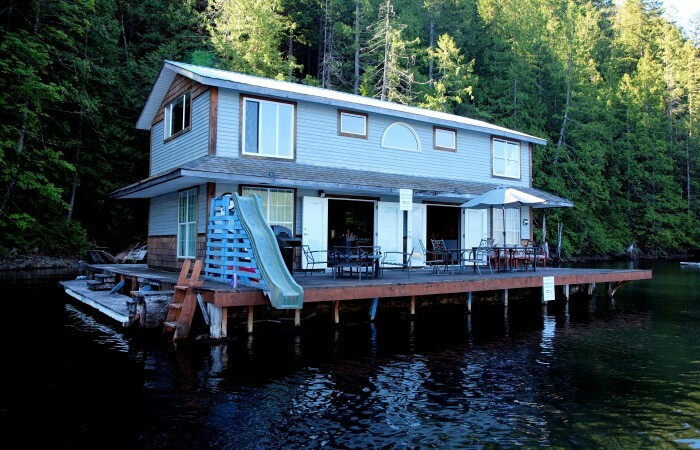 After about two months away we are finally going back up the lake. I'm so excited! For the first time we became Canadian Snowbirds and headed to Arizona for some winter sun. 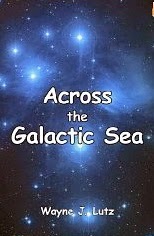 You can read all about it on my sister blog, Margy Meanders. 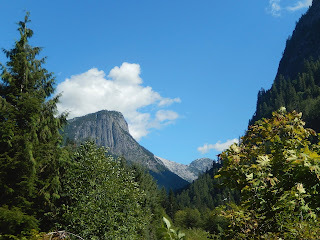 I finished the time up with a bit of surgery and recovery at our Bellingham condo in the States. Now we get to go home! I want to see what has happened in my absence. Did my daffodils bloom and herbs survive the winter? 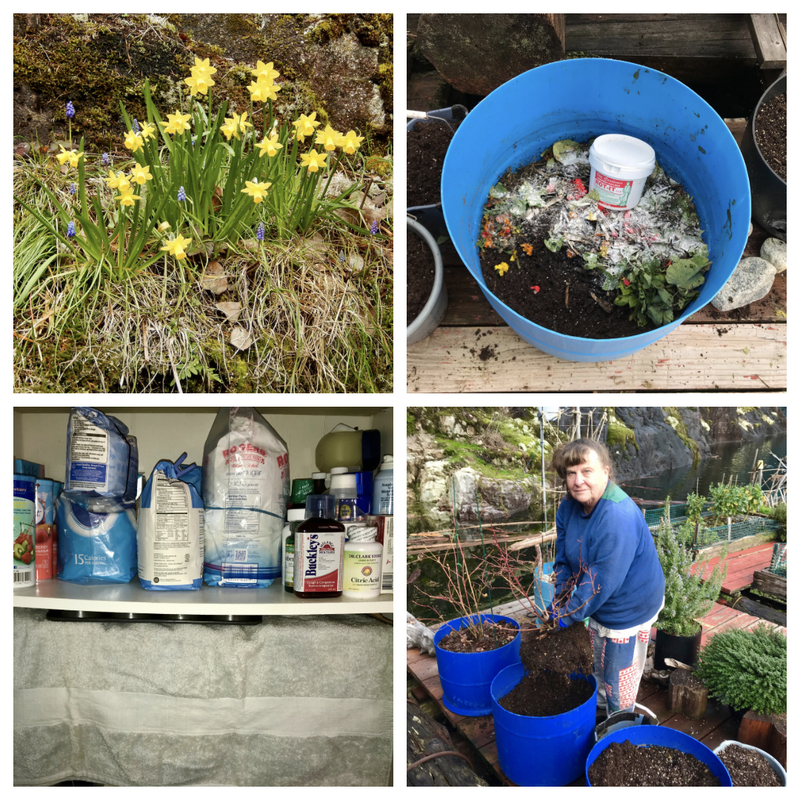 How is my composting experiment in plastic barrels doing? Did my potatoes in storage and canning jars in the pantry escape freezing during the cold spells. And did my transplanted blueberries get new growth? Has there been any wind or snow damage? 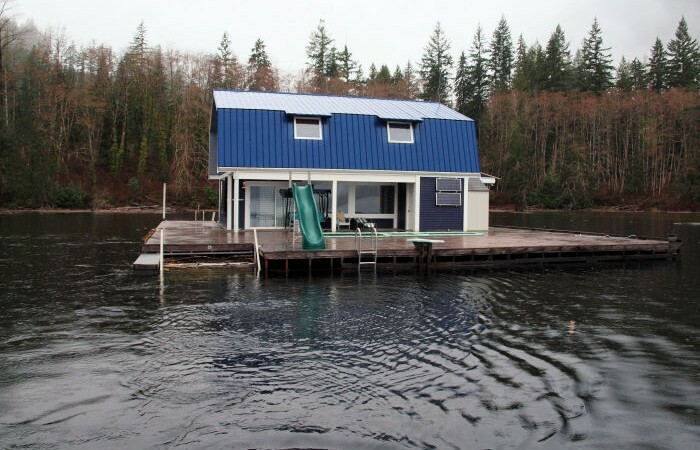 What about the lake level? We'll soon know the answers to all of our questions. Why do we love it so much? It's the best place on earth to live. 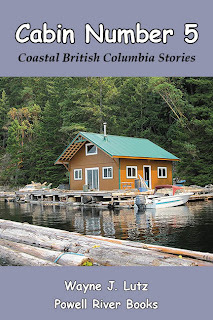 Besides reading my blog, you can discover more about float cabin living at our YouTube Channel and in Wayne's Coastal BC Stories books. 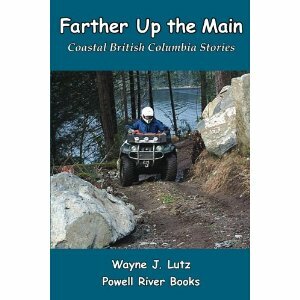 The first, Up the Lake, is available for free as an e-book at Amazon and most online booksellers. 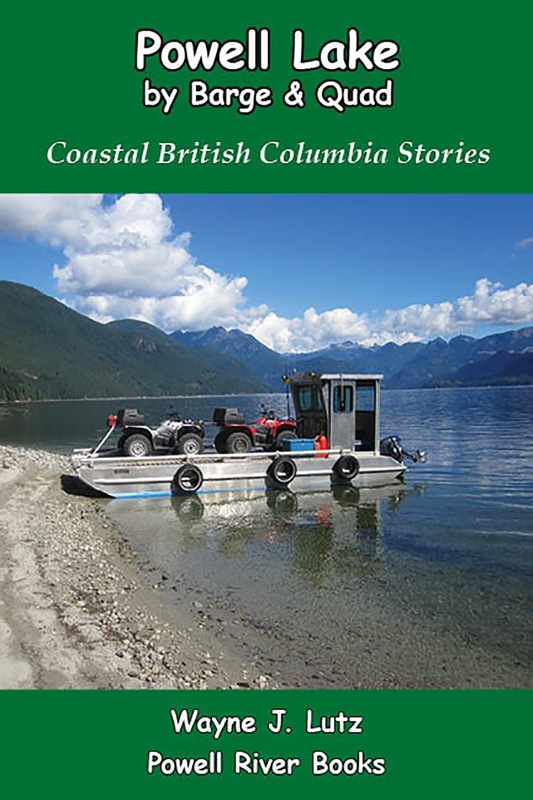 Chapter 2, "Boats and Planes," tells about how we discovered Powell River and found the home of our dreams floating on a lake. 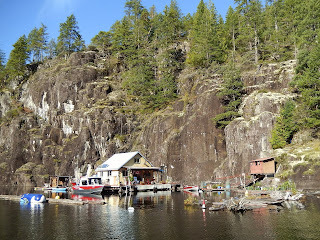 Wayne and I love living in our float cabin home on Powell Lake in all seasons. 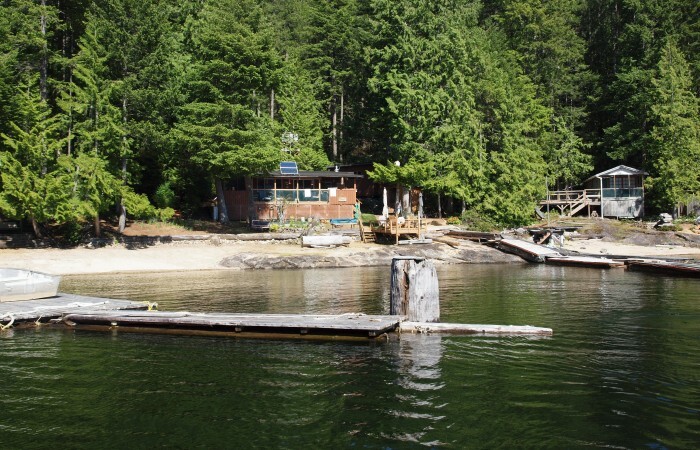 Spring is a special time up the lake. The maples are turning green and the dogwoods will soon be in bloom. That's a sign for good fishing. 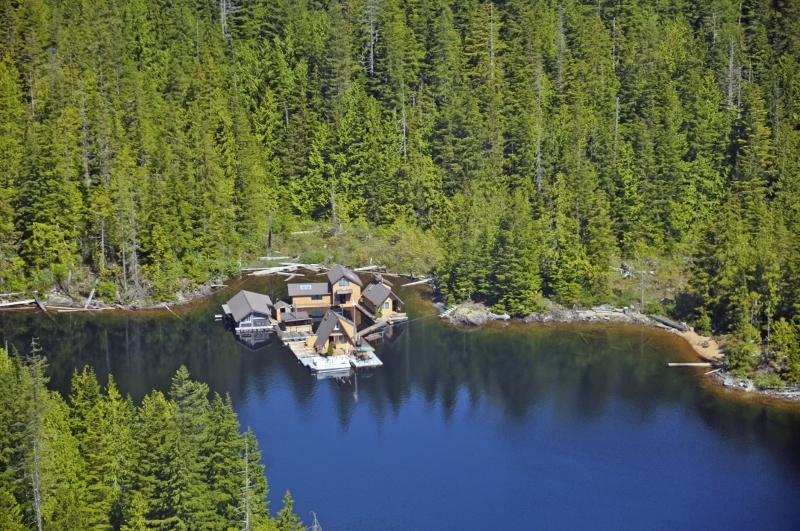 Only a few float cabins and land properties are on the market, so don't wait too long. 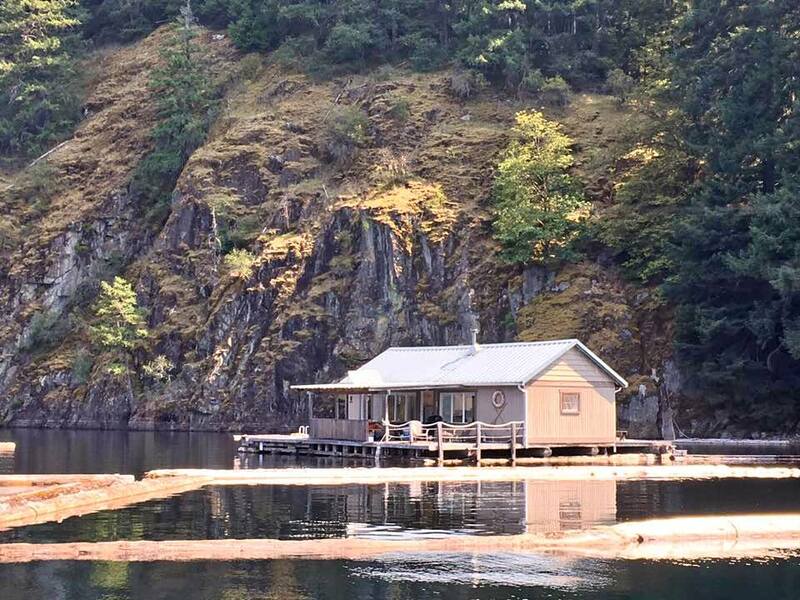 Purchasing our float cabin home was the best thing we ever did. Why don't you come up and see what Powell Lake has to offer. 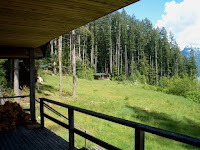 5 Acres and a Dream: The Blog link. 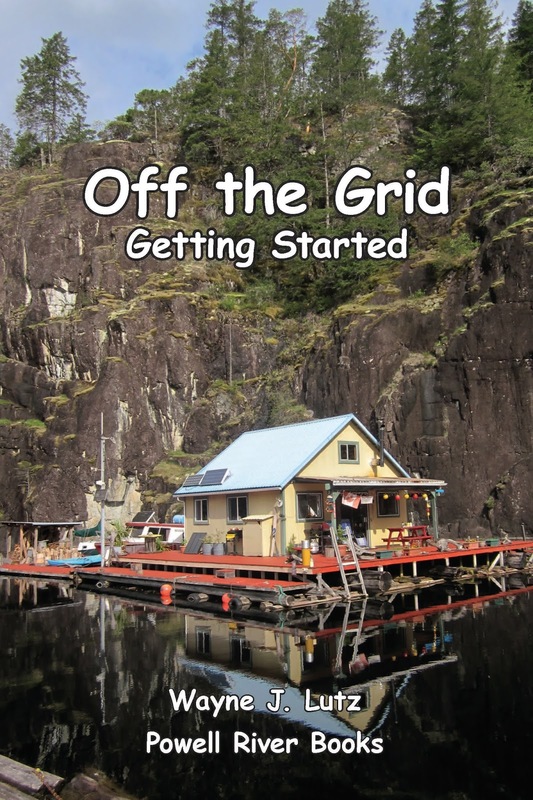 I enjoy reading blogs written by people, especially women, who live off the grid or in remote locations. 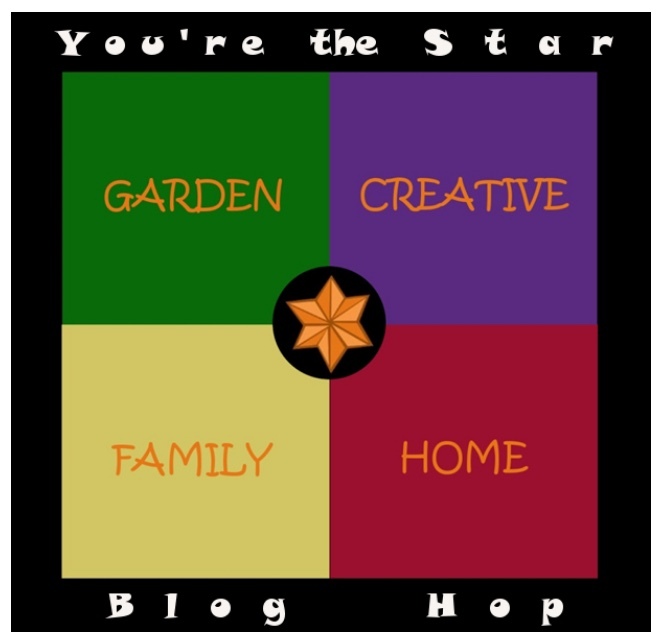 Many off-gridders don't blog or write online, so I also follow homesteaders. 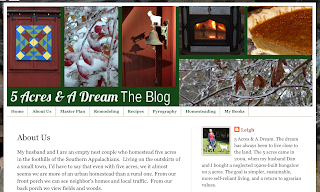 My online search led me to Leigh Tate's 5 Acres and a Dream: The Blog. 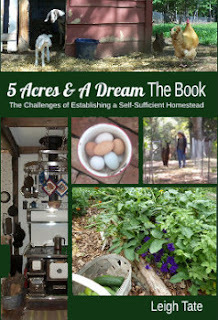 After reading her posts and communicating through comments I decided to check out her book 5 Acres and a Dream: The Book. I'm glad I did. 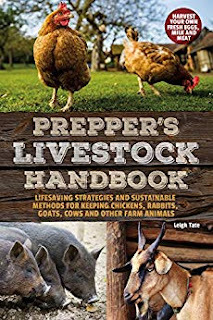 It tells about how Leigh and her husband Dan started homesteading on a five acre plot with an aging house and structures that needed lots of work to make them into their dream homestead. 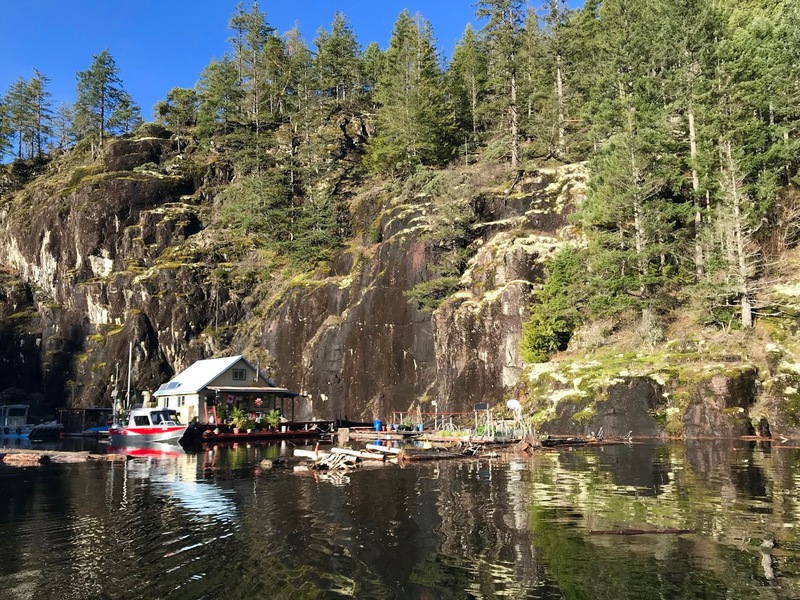 Leigh describes their mutual dream for "a simpler life, a life that gave us a sense of purpose, appreciation, and satisfaction with what we do and how we do it." 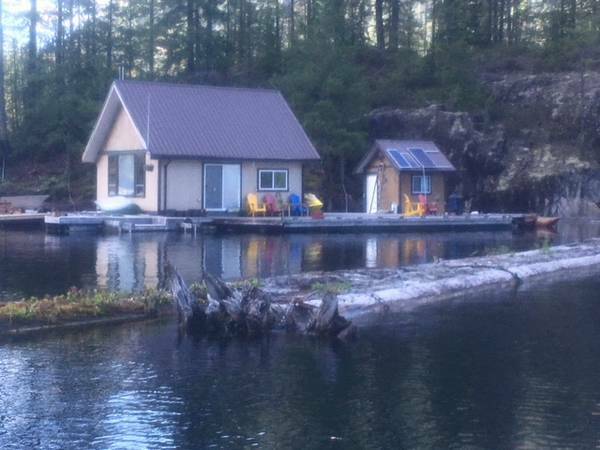 Their homesteading mindset began early while raising and homeschooling children, but never on land of their own. With their children grown, planning began in earnest for a dream homestead. 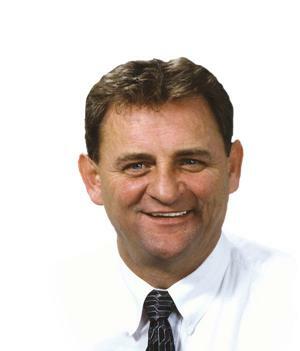 Cost was an issue, so their plans evolved over the three year search, and through the subsequent years on the new to them property. Flexibility made them so successful. The Establishment Phase - rethinking what was necessary. 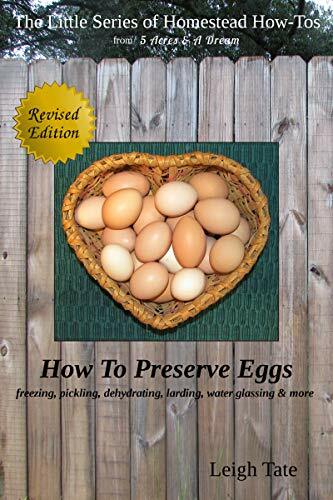 Food Self-Sufficiency - growing and preserving food. Energy Self-Sufficiency - including a wood-burning cookstove. 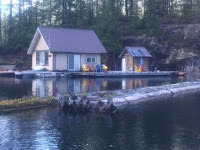 Water Self-Sufficiency - including rainwater and greywater tips. Obstacles and Difficult Things - homesteading isn't easy. 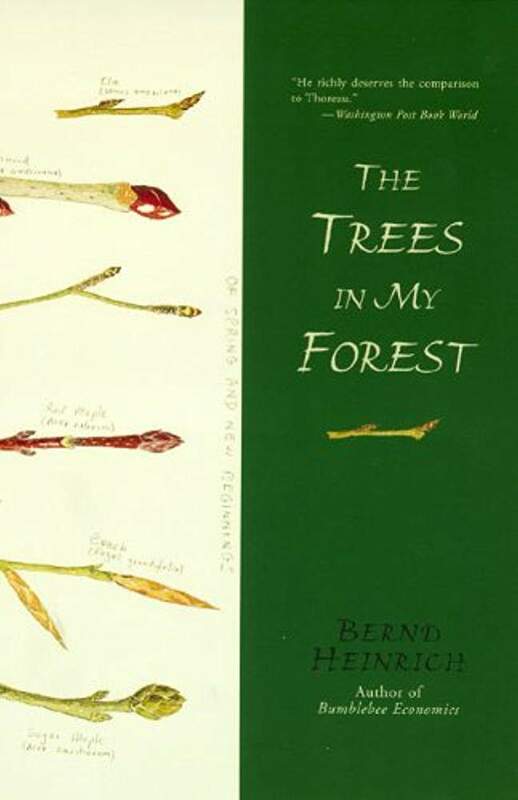 The book is filled with photographs and drawings to illustrate and enhance the story. 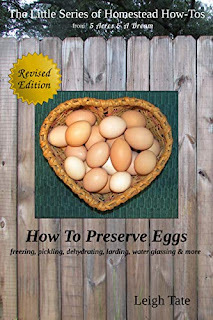 There are even some homestead recipes to try. Leigh has written additional helpful homesteading resources.